Home > General	> Sorry Elisa! Recently a customer contacted us regarding some issues with the game. We’re not sure if it’s a problem with the game, or with the customer’s device but in any case the customer requested a refund. But… there is no way for us to refund unless we have the Order Number associated with the purchase, so I emailed the customer to request this information. So I can’t contact the customer to get their Order Number, to refund their order! 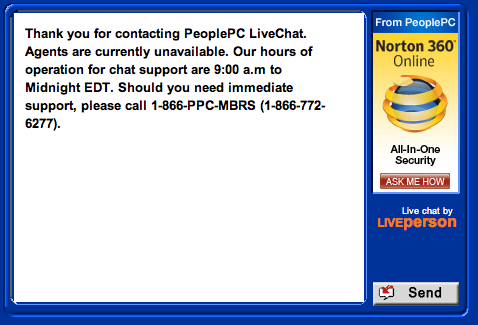 That’s OK.. I’ll just contact the support for PeoplePC… after all, they have 24/7 Live Support right? So If you’re out there Elisa… please send me your order number! Oh.. and for anyone else reading… may want to skip past the PeoplePC aisle when browsing for an ISP… just my opinion.